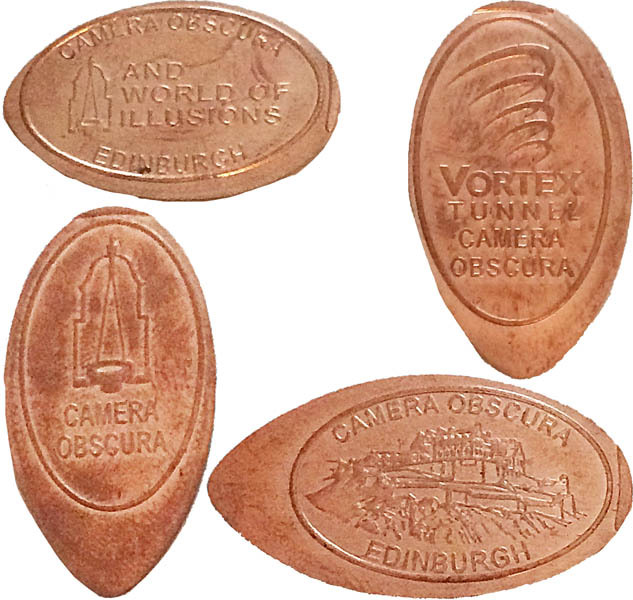 Camera Obscura is Latin for darkened chamber or room. It an optical device that projects an image of its surroundings on a screen. Entrepreneurs would take portable obscuras in tents to entertain. The mechanics of the Camera Obscura are a cross between a giant pinhole camera and a periscope. At the top of the tower is a dark chamber with a mirror on top which reflects light downwards, passing through three lenses before projecting a stunning image of the city onto a large white table. Your guide turns and tilts the mirror to give a 360° tour of Edinburgh while giving a fascinating and fun commentary. Have fun in the mirror maze and Vortex tunnel. There's also an automated wedding machine here too. The admission prices are: Adult: £12.95 Student (with ID): £10.95 Senior: £10.95 Child (5 - 15 years): £9.50 under 5's go free. Hours of operation: July, August: Every day 9:00 am - 9:00 pm (21:00). Your ticket is valid all day! September, October: Every day 9:30 am - 7:00 pm (19:00). Late opening on public and school holidays: 9:30 - 8:00 pm (20:00). November through March: Every day 10:00 am - 6:00 pm (18:00) [Closed 25th December] Half term holiday: 10:00 am - 8:00 pm (20:00). April through June: Every day 9:30 am - 7:00 pm (19:00). Late opening on public and school holidays: 9.30 am - 8:00 pm (20:00). Parking is very difficult to non existent. This machine is within easy walking distance (round trip 1 mile) to the Edinburgh Castle, Edinburgh Old Town Weaving, The Real Mary King's Close, Edinburgh Dungeons, National Museum of Scotland, and Museum on the Mound (Bank of Scotland) penny machines. 1. 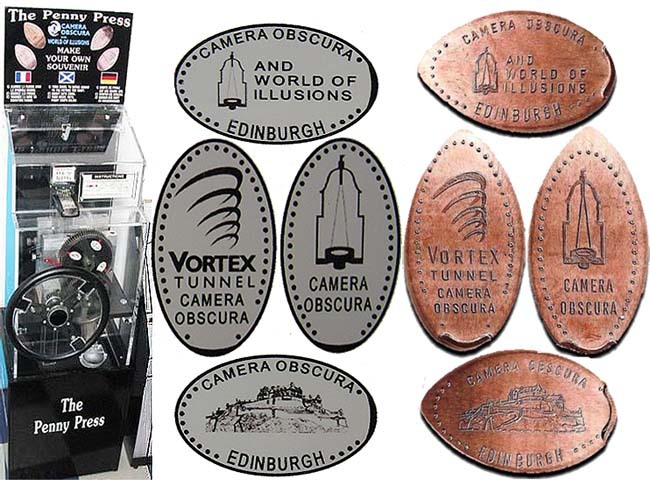 (H) A small camera obscura with 'and world of illusions Edinburgh'. 2. (V) A large camera obscura with 'Camera Obscura'. 3. (V) Vortex tunnel with 'Vortex Tunnel'. 4. (H) Edinburgh castle with 'Edinburgh'. 7/26/18: There is a new machine onsite replacing the old one. It is now situated within the gift shop. The new machine has a hopper which provides the penny. The images are the same as the old 4 but the dotted borders have been replaced with lined borders.